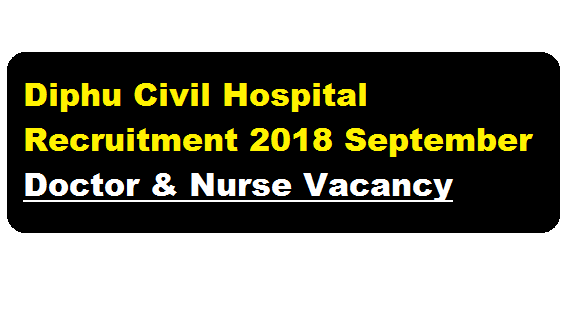 Diphu Civil Hospital Recruitment 2018 September | Doctor & Nurse Posts:- Diphu Civil Hospital has issued a recruitment notification for the month of September 2018. According to the Diphu Civil Hospital Recruitment 2018 September, Walk-in-Interview will be held for filling up the 2 vacant posts in Opioid Substitution Therapy Center (OST Center), Diphu Civil Hospital, Diphu under Assam State AIDS Control Society, Khanapara, Guwahati- 781022 initially for a period upto 31.3.2019 on contractual basis and may be extended based on performance appraisal. In this section, we will discuss in detail about Recruitment of various posts under Diphu Civil Hospital Recruitment 2018 September with all the details and requirement. Educational Qualification: Candidates must be MBBS. Preference will be given to the candidates with MD in Psychiatry/Diploma in Psychiatry Medicine. The candidates must have valid registration with the concerned Medical Council. Age Limit : Maximum 62 years as on 01.08.2018. Candidates must appear at the walk-in interview. Following are the interview details. Venue of Interview: Office of the Superintendent, Diphu Civil Hospital, Diphu, Dist: Karbi Anglong. The applicants should come with all the original testimonials. A standard form of application along with a set of photocopies of all the original documents and a recent passport size photograph should be submitted before the interview board. No TA/DA will be paid for attending the interview.